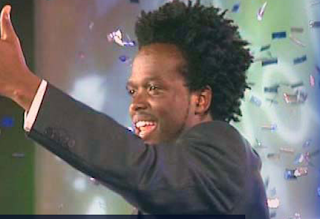 After the final face off between Eric Moyo and Nichollete Kiiga, Zimbabwe has something to celebrate after their son Eric Moyo won Idols East Africa 2008 in a 90 minute finale at the Bomas of Kenya. Eric is a brilliant singer who most certainly deserved the US$80,000 and the Sony BMG recording contract. He got himself, the judges and his mother all teary eyed with Michael Bolton’s ‘When a man loves a woman’. No blushes for Angie this time. All the attention was for mum and the audience. ‘This is my everything’ which BMG composed for him was just not Eric at all and other than the words, the melody and the flow of the song did not match the magnitude of the moment. And it did not sound any better the second time round after he was declared winner. BMG could have done better. OK... Shiko you are right about that funny song from Sony BMG. I was pissed off as he unveiled it. Have you ever been to a paint factory and witnessed an accident? Me neither! But that song looked like the work of a mixture of paints that is then cobbled up as a painting. When Trinah left, I would however have liked Eric to win rather than Nicolette so I guess the end justifies the means, eh? And Eric (the other one) from Naija! With shades!!! Shady! Well no suprises this weekend! No doubt Eric was the only possible winner and will look forward to more from him in the future. the show was great and the TVProduction one of the best I have seen done in Kenya although Bomas is not an ideal soundstage. Nicolette will be great if she sticks to emotional ballads. Kirima haki that's the same question I'm asking myself. And the way I was guaranteed an article on Mondays! Big bro is around the corner although I'll be doing it on a different blog. It's back to research. The Bomas sound stage yeah - you're right. Our Kid your description of the Sony song is spot on. I was afraid to get too graphic but the song was a real accident. From a place like BMG surely you expect a spectacular song. From what I can remember of (mindnumbingly boring) outings there as a child, the place had the acoustics of a barn. They must have sounded awful! hahaha Mo. Me when I think of Bomas i remember the attempt at constitutional review! Never been there though - just seen on telly. But the sound system and the lighting are just so last century. Eric must be a Gazillionaire back home! Nusumbili I've tried to do that math it's just too big. Ebu try to calculate and let's see if we come up with the same figure. Are you still in Kikweteland? There were too many Erics there to keep track of. Even one of Eric the winner's bodyguards was called Eric! Not to mention that's my name as well, so it was pretty confusing. As stated, I have never watched Idols. This was my very first time to do so. And so I can't say what it sounded like on tv. But at the place, I didn't find any problems with the acoustics. And yes, Eric with shades was shady! Good thing he took them off towards the end, thus enabling us to get a good shot of him. We have something on him on zwTube as well check it out. Hook me up on isaac@zwtube.com and lets exchange notes. Hi ZW. I actually visited both of those sites on Monday - good to know who was behind them. I'm based in Kenya.